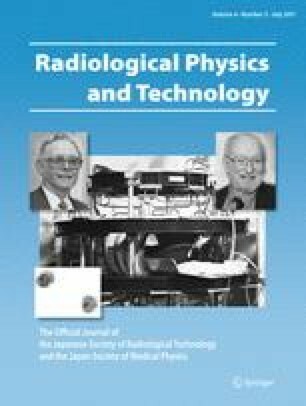 Our purpose of this study was to present simulation and experimental studies on magnetic hyperthermia (MH) with use of an alternating magnetic field (AMF) and superparamagnetic iron oxide nanoparticles (Resovist®). In the simulation studies, the energy dissipation (P) and temperature rise rate (∆T/∆t) were computed under various conditions by use of the probability density function of the particle size distribution based on a log-normal distribution. P and ∆T/∆t and their dependence on the frequency of the AMF (f) largely depended on the particle size of Resovist®. P and ∆T/∆t reached maximum at a diameter of ~24 nm, and were proportional to the amplitude of the AMF (H 0) raised to a power of ~2.0. In the experimental studies, we made a device for generating an AMF, and measured the temperature rise under various concentrations of Resovist®, H 0, and f. The temperature rise at 10 min after the start of heating was linearly proportional to the concentration of Resovist®, and proportional to H 0 raised to a power of ~2.4, which was slightly greater than that expected from the simulation studies. There was a tendency for the temperature rise to saturate with increasing f. In conclusion, this study will be useful for investigating the feasibility of MH with Resovist® and optimizing the parameters for it. The authors thank the editors and reviewers who spent a great deal of time and gave us informative advice for improving our manuscript.